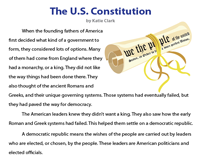 This compilation of worksheets on U.S. Constitution helps children in learning the frequently used terms with the constitutional vocabulary, comprehend the seven basic principles, Preamble, Bill of Rights, amendments 11 through 27, figure out the functions of three branches of the government, understand the system of checks and balances. Also, included here are reading comprehension passages on the Constitution of the United States and Great Compromise of 1787 to mention just a few. Understanding novel terms is vital in learning. 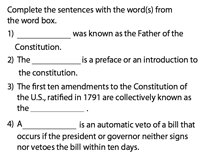 This vocabulary worksheet familiarizes students of middle school with the frequently used terms in the Constitution along with precise and apt definitions of each term. 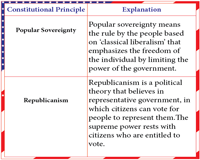 Equip students of grades 5 through 7 with this chart for an in-depth knowledge of the seven basic principles such as federalism, republicanism, popular sovereignty and more with clear explanations. Reiterate the seven basic principles with this worksheet. 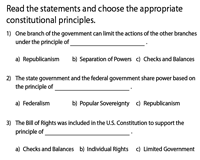 Direct students to read the sentences carefully, figure out the constitutional principle stated in each sentence and check the appropriate option. The declaration of rights or the first 10 amendments collectively called the Bill of Rights are clearly stated in this poster. 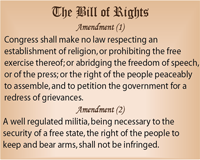 Comprehend each amendment and get a clear picture of the rights. The Bill of Rights guarantees rights and liberty is what we all know! 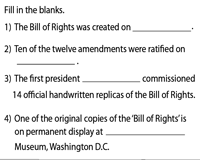 Check how much more you know about the basic facts of the Bill of Rights with this fill-in-the-blanks worksheet PDF for grade 6. 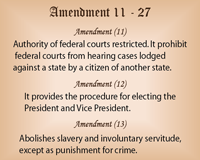 The amendments numbered 1 to 10 are presented in one column and a precise description of each in the other. Instruct students of grade 5 to pair up the amendment numbers with their descriptions. Incorporate this amendment chart comprising amendments 11 through 27 and acquire knowledge of the rights stated in these amendments using the brief and apt explanations offered for each amendment. 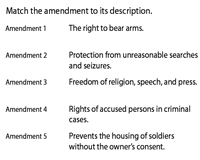 Recapitulate the amendments with this numbering the amendment worksheet. 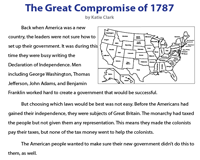 Sixth-grade students read each sentence and identify the amendment, which states it and number the amendments accordingly. 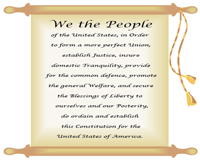 The Preamble states in general terms, the intentions of the Founding Fathers regarding the Constitution's meaning and what they hoped the Constitution would achieve. 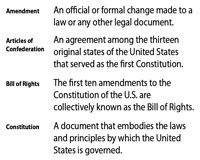 Comprehend the goals of the Constitution with this Preamble Chart. 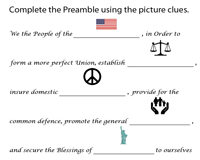 Recapitulate the goals of the U.S. Constitution which are form a perfect union, establish justice, insure tranquility, promote welfare, provide for common defense and secure the blessings of liberty with this Preamble fill-in-the-blanks worksheets. The powers of the U.S. Government are distributed among the executive, legislative and judicial branches. 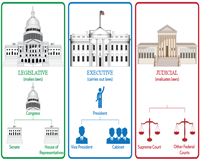 Learn about the three branches of the U.S. Government with ease employing this anchor chart. 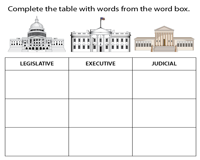 Included in this follow-up worksheet is a table with three columns for the 3 branches of the government of the United States and a word box. Sort the words in the word box, categorize and write them under the branch they belong. 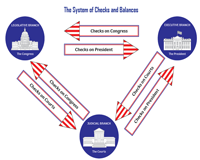 Gain an insight into the concept of checks and balances with this display chart. Each of the three branches of government can limit the powers of the others under the principle of checks and balances. 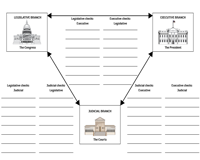 Instruct 7th and 8th grade students to research and find out about the powers possessed by each branch of the government and how they are checked by the other branches and write a brief note on each branch. The images of the four Founding Fathers or framers of the Constitution are presented here. Fifth-grade children can research and figure out the role of each and write a few lines about them as well. 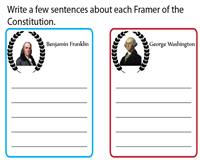 Learn a few important terms like Jus soli, pocket veto and review facts associated with the U.S. Constitution using this fill-in-the-blanks worksheet for middle school students. 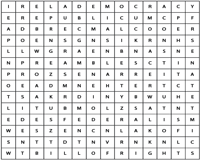 Hunt for ten words associated with the Constitution in this word search worksheet comprising a 14 x 14 grid. Look for words like Republic, Federalism, Amendment and more and enhance your spelling and vocabulary. Let's go back in history to find out how the framers decided on what type of government to form, how the constitution was framed and the amendments with this reading passage for students of grade 8. An agreement between the large and small states during the Constitutional Convention of 1787 referred to as the Connecticut or Sherman Compromise is what this passage deals with. Eight grade students answer questions that follow to recap knowledge acquired.